We're still dreaming of spring weather, despite the rain and snow outside so this week we're sharing with you our inspirations for Pantone's Spring Color: Classic Blue. 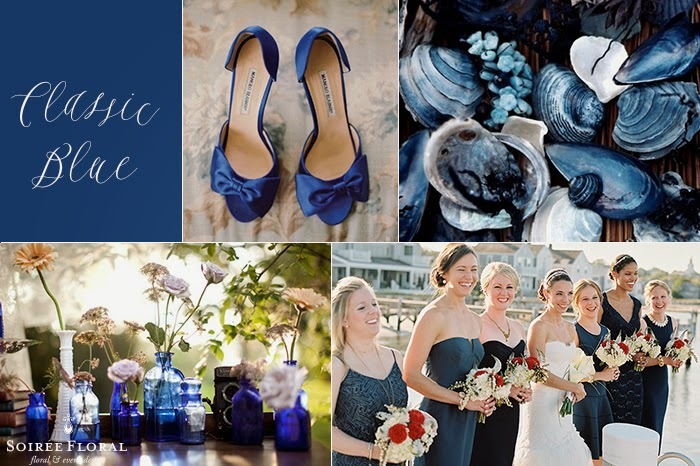 Classic Blue can also be transitioned into fall when paired with Marsala - plus, adding in that pop of blue will give a nautical nod to all you 2015 Nantucket brides. For all of you spring and summer brides - try incorporating Classic Blue into your palette by pairing it with Toasted Almond or Glacier Grey, or what about Custard? We've also put together a style board over on Polyvore if you're looking to incorporate Classic Blue into your everyday or wedding style. Check out our other Pantone-inspired blog posts here.